Abbotswood at Stonehenge is distinguished by exemplary service delivered with integrity, dignity, and compassion. Our full-service community features individualized services and tailored amenities tuned to the rhythm of our residents and their families. We offer Independent Living and Assisted Living* through our on-site supportive care services provided by home care company, Onsite Home Care. The caring staff of Onsite Home Care provides a variety of scheduled á la carte services and packages. Residents are given assistance with activities of daily living in a positive, engaging environment. Customization for residents is far greater than a traditional Assisted Living community because you receive only the services that you want and need. Our goal at Abbotswood at Stonehenge is to enhance each person's lifestyle. Come experience our community and you will immediately feel the difference. Engage, challenge yourself, give back, and build a legacy for future generations — this is our invitation to you. 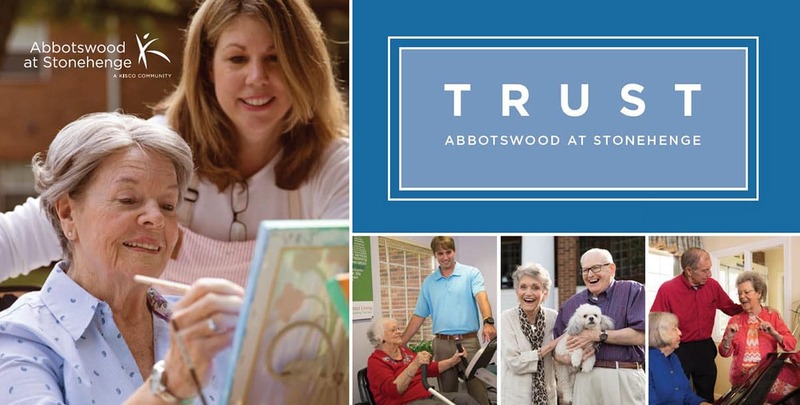 *Abbotswood at Stonehenge is a multi-unit assisted housing with services- an assisted living residence in which hands-on personal care services and nursing services are arranged by housing management and provided by a licensed home care agency, through an individualized written care plan.